For his trip to Haiti in Quantum of Solace, James Bond wears a black pique-knit polo shirt by Tom Ford with a small rounded breast pocket and a two-button placket. The polo has a tight fit and very short sleeves to show of Daniel Craig’s muscles. The Polo is very similar to what Sunspel made for Daniel Craig in Casino Royale and confused many people as to the polo’s origin. The trousers are off-white Levi’s 306 STA-PREST jeans, a line originally from the 1960s. But these are much more than just jeans, even beyond the unique colour. Levi’s intended for these jeans to be worn pressed with a crease down the leg for a less casual look, though Bond’s jeans are not creased. Little did Levi’s know in the 1960s that forty years later jeans would be acceptable for dressier occasions and be worn with dress shirts and jackets by the more fashion forward. The fabric is a twill weave with a strong diagonal rib in a cotton/polyester blend to prevent wrinkling. Like most jeans, these have a five-pocket design, including patch pockets in the back. Bond wears these jeans with a cross-hatched black leather belt with a silver buckle by Prada. After a nasty fight that tears up Bond’s polo, he finds a black Adidas Y-3 jacket to wear over it. The jacket has a collar, set-in sleeves and a zip front. The fabric is most likely a cotton and polyester blend. It has two lower hand-pockets. Bond’s shoes are Church’s Ryder III Chukka Boots in brown suede with a Dainite® studded rubber sole. Bond makes a bold move by wearing a black belt with brown shoes. He does this to match the belt with the jacket and polo shirt instead of his boots. Even though the jacket is not Bond’s the costume designer still planned the outfit to go together. But if Bond wanted to wear a black belt to match with the shirt and jacket, black boots would be have been a better choice. The brown boots go well with the off-white jeans and the black shirt also goes fairly well with the jeans, but the problem arises with tying the whole outfit together. Though brown and black can work together, the brown boots and black belt undoubtedly clash. Men’s clothing should never look “matchy-matchy” but we should not forget all about coordination. The clash gives the outfit a more thrown-together look, but not a well-dressed look. A brown belt with a blue shirt and blue jacket would have worked much better. I haven't watched Daniel Craig in this movie having switched off him after his debut one however, I did see stills from Quantum of Solace and his totally un-Bondian choice of clothing. Jeans ( I think I recall he had a dark blue pair in another photograph) are better suited to heroes of an American pedigree than a British icon like Bond.I know the producers have attempted to reboot (no pun intended) and modenise the character but I don't think it works in this way. It could be argued that this outfit is just a modern take on Connery's knit polo shirt and cavallry twill trousers worn in Thunderball, but I think jeans are a bridge too far for Bond. Bond wear jeans in several of the novels actually, if I recall correctly. Matt can surely fill in with more information. As far as jeans go in the novels: In Dr. No, Bond wears "cheap black canvas jeans." In For Your Eyes Only, Colonel Johns tells Bond to get dark brown jeans from a second-hand clothing store. Ah, it's been a while since I've read the books. It's more in realtion to the films that i'm coming from really. I can't recall any other instance, pre-Craig's tenure, in the movies when Bond wore jeans. Somehow you just don't imagine it. Although, I did see footage somewhere from A View To A Kill which, i think, was subsequently never used and I think Moore also had jeans on. Very casual clothing doesn't seem to fit the cinematic Bond's image and some of Craig's apparel seems too casual for Bond. Ditto Dalton, esp in the execrable Licence to Kill. Roger Moore wore a denim outfit in Live and Let Die, more casual than most of Daniel Craig's outfits. I rememeber it now and a hideous sight it was too. Not one of his better moments at all. I only watched Craig's first movie and even in the opening part he was running around in a beat up hawaiian style shirt over a t shirt and battered trousers. This was, let's just say, not very Bondian and I cannot envisage Connery, Lazenby, Moore or Brosnan in such apparel. Craig's suits etc were ok but I still think there were quite a few un-Bondian outfits. Of course Bond dresses casually some of the time, in all of the movies, but it's a fine line and very easy to make errors with. I agree Moore, Connery and Brosnan had their fashion faux pas' but I don't think on the same scale or frequency as either Craig or Dalton and I believe this is the whole "modernisation" thing. There's been a definite attempt by the producers to produce a grittier, modern Bond with modern manners and dress and I'm just not sure this approach works for the character. I thought that the polo shirts in QoS were dark navy blue, not black? The polo shirt at the end of the movie is definitely navy. But this one I figured was black since Bond's belt and jacket are both black. Louise Frogley never stated what colour the shirts are, and I don't have the costume card for this outfit. But you may be right. I'll change the article. Thanks for pointing this out. at the Connery era Bond used to wear suits, but their were simple and easy, and has kinda-casual extras (you know, like a knit-necktie, the most casual kind of necktie). Later, at the Brosnan era, Bond's looked like some super-model. And that was weird and funny. Nowadays you just can't wear suit casual — for many guys it's the most formal suit in their lifes. So Craig's Bond wear casual, but still elegant clothes. And in my opinion their still Bondian (even in that fact, that Craig's Bond wears just three-pairs of jeans [at the morning talk with Mathis in the casino, at the Haiti, and in the last fight in QoS] — most of the time he's still wearing other kinds of trousers, whilst most of the guys wears jeans all the time. I must respectfully dissent from some of the comments concerning Craig's casual wear, and wholeheartedly agree with the last anonymous post above. Bond should be appropriately dressed. When traveling abroad as a businessman for Universal Export or visiting M's office, a proper suit is called for. When on a covert operation in Madagascar or Haiti or sailing into Venice, a suit, whether Brioni, Tom Ford, or Sinclair, would be most improper. Perhaps our conception of Bond as always wearing suits is grounded in the films' early 1960's origin's, a time when men generally suits for most occasions (and my dad mowed the lawn in one). I believe Craig is the first Bond to wear casual wear well. Connery's casual choices were often bad and bland in his last three or even four movies, and Moore and Brosnan didn't even attempt casual clothing often, causing them to stand out in their finely tailored suits in India or Azerbaijan, or look awkward when they did wear casual. And all three tended to look "old-manish" too often. Craig generally pulls off the casual wear and the suits well, unlike Moore, Brosnan, and Dalton who didn't do well with one or the other. The generational thing undoubtedly plays a big part in the change in interpretation of Bond which has taken place in recent movies and Connery and Moore were from the same generation as Christian’s dad who mowed the lawn in the suit. Bond, as a phenomenon, was were it was at both in the 1960’s under Connery’s stewardship and then as the big, fantastical blockbuster of the 1970’s with Moore. By the 1980’s the Bond phenomenon began to wane and the series lost direction a little. Men’s clothing began to get progressively more casual in nature right from about when the cinematic Bond first appeared in the 1960’s and the trend became more pronounced as the years passed before merging into scruffiness in the last decade or so. One movie reviewer of the 1970’s memorably referred to the character as a “well heeled dilettante”. In other words, an educated, refined man of the world with a taste only for the very best. In short, an elegant man. This elegance has always been a fundamental part of Bond’s style and make up. This interpretation came from the literary character, who reflected Fleming’s own tastes, and the books are peppered with references to exclusive labels and brands. The movies expanded on this and with a director like Terence Young on board seemed a natural process. Also, I come back continually to 007’s military heritage. This is integral to any portrayal of the character as it will have an influence on how he dresses. Connery, Moore and (I think) Brosnan all appeared in naval uniform at least once during their respective tenures. I don’t feel Connery, Moore and Brosnan looked “old mannish” but elegant and stylish, as befitted their time and I don’t think they looked “uncomfortable” in their casual wear at all. Indeed, Connery was quite irked during filming You Only Live Twice in Japan when reporters criticized his downtime clothing as being un-Bond like in its casualness and caused Connery to retort that he was “Sean Connery, not James Bond” and that, when not playing the part, liked to dress comfortably. No doubt he would have been pleased to play the part 40 years later! To say that Moore and Brosnan didn’t pull off the suits well is far from the truth when both appeared most at ease when formally dressed and indeed looked best in such a setting, although I agree about Dalton. The dilemma for the producers is how to “move with the times” leading many old time Bond fans to conclude that the series should’ve been shelved some time in the last couple of decades. But Bond is a moneyspinner and so an updating of the character was undertaken with the traditional Bond swept away as the producers connect with the I Phone and Facebook generation. Instead, to please the new “instant gratification” audience elegance and wit is jettisoned in favour of curt bad manners and Craig’s graceless performance. Bond has become a muscle bound Duracell bunny strutting and punching witlessly through his adventures to compete with Bourne et al. As a long time Bond fan I have given up the ghost on the series and I can’t help feeling Cubby Broccoli himself, never mind Ian Fleming, would agree. Anyway, I will leave further debate on Bond's current incarnation to others as I've more than made the point and it is, after all, just a personal bias.. 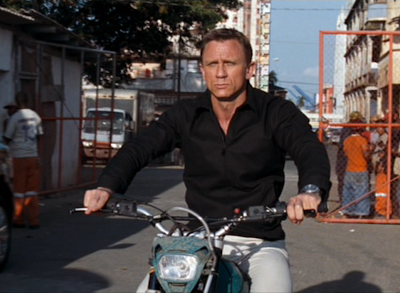 I like the Riviera Polo from Sunspel from "Casino Royale" better than Tom Ford's. The quality is much better than what you're paying for in the designer name. Great blog–one of my favorites! Your points are well-said and salient. I do want to clarify one thing I said that you reference. I never said, or meant to say, that Moore and Brosnan did not pull off suits well. What I said was Moore, Brosnan, and Dalton did not, with respect to casual ware and suits, pull off “one or the other”. I thought it obvious that I was referring to casual ware with Moore and Brosnan. Both actors were extremely comfortable in suits. I do think that only the pre-1966 Connery, Lazenby, and now Craig look equally at home in both suits and casual clothes. Your comments do point out an interesting aspect in the Bond character, as written by Fleming. While true that Bond was “well-heeled” (I am not sure I agree with the term “dilettante”, as according to Webster’s definition I don’t think Bond was ever a lover of the arts, or an amateur) and reflected Fleming’s tastes, he also reflected a fantasy version of Fleming’s self – and that fantasy was an action hero, a serious spy, and a “blunt instrument”. The literary Bond was often tortured, beaten and hospitalized by the book’s end. He is an extremely serious covert operative, with very specific, snobbish tastes. These two components to the character are apparently tough to blend and the tension was reflected in the original casting decisions: Fleming apparently preferred David Niven to be cast as Bond and was appalled at Connery’s lack of refinement. Later, Fleming changed his mind when he saw Connery in character, and even gave the literary Bond a Scottish heritage. For their part, the producers wanted a “ballsy Englishman” to appeal to American audiences. This “ballsy” aspect of Bond’s character slowly faded away so that, with a few exceptional scenes, it was, by the 1970s, gone. After toughening up in the 1980s, the 1970s portrayal often returned during Brosnan’s tenure, again with some scenes excepted. This balance of the sophisticated Englishman (David Niven if you will, or Cary Grant, or William Powell), and the tough covert operative/action hero (Bruce Willis’s John McClaine, Arnold Schwarzeneggar’s Harry Tasker, and of course, Harrison Ford’s Indiana Jones) is apparently tough to do well (Cary Grant’s Devlin in Notorious is a perfect blend). I do think that Craig, to my surprise, pulls it off well, particularly in Casino Royale. And, going back to what brought us to this blog, I do think Craig pulls off the suits and the casual ware extremely well. He is suited up often in both of his movies and is not out-of-place in them (though I think Tom Ford and Louise Frogley may not be perhaps the best choice), and his casual ware is the same. Indeed, he blends into the crowd in the Madagascar scenes, arrives in the Bahamas in a light colored linen (?) suit ( I defer to Matt on the details), lounges around the Ocean Club in casual ware, suits up when traveling as a businessman, and fills out the dinner suit well for the high-stakes gambling (though why the director has him take off the jacket during the final round is beyond me; it is both improper and hard to photograph). The good news is that, while clothing expectations have changed since 1960, the suit has been on the comeback. I know in my business (commercial litigation) the casual movement of the 1990s has hit a brick wall and suits are now expected, unless Silicon Valley is involved. Other great young directors like Chris Nolan are suiting up their heroes as seen in Inception and The Dark Knight (Christian Bale wears a great blend of suits and casual ware). And a younger generation of Hollywood stars (I do live in L.A.) are often seen in suits by Tom Ford, Brioni, and Kilgour. And there is a great tailor in Santa Barbara who cuts Sinclair-like suits and has a waiting list for appointments due to his popularity among L.A.’s Westside crowd. So there is hope for those like me who that take their suit style inspiration from 007. Do you know the exactly length of DC Bond's polo? Shold it cover the pockets of the jeans? The shirt covers the top half of the pockets in the front and is a little longer in the back. So is this polo black or navy? Bc I thought black should never be mixed with brown? Even with the choice in clothes and shoes. We’re you able to get the costume card for this outfit yet Matt? I don’t have the costume card for this one, but I’ve been told that the polo is actually navy whilst the jacket is black. Black and brown can definitely be worn together, though the belt not matching the shoes is what the problem is. And a dark navy shirt and black jacket clash. That combination really only works when you’re wearing a dark navy suit with black shoes or a midnight blue dinner jacket with black lapels. Colour matching isn’t so straight-forward and there are no rules, you just need to use your judgement. Are the cream jeans just standard straight legs Matt ?, they don’t look nearly as slim as the chinos from Spectre. Various brands make similar jeans, now that lighter colours are in fashion. They have a slightly tapered leg. I am attempting a similar look, but instead with black boots and very light grey chinos. Many thanks for your reflections on this. The Y-3 jacket looks like in the film that it has an elastic waistband but jack at the back and not the sides for a cleaner, more modern front. Quick question. If one was to get vintage STA-Prest trousers, would it be possible to get them tailored or tapered down at all? My concern is the chemical press in the pant and it being off center after getting tapered. Thanks! When tapering trousers it should be done from both the inseam and the outseam so the old centre is still in the same place.